Tags and categories on posts are used to help readers locate information in different ways. When your readers click on a categories or tag link on a post or in your sidebar it loads a page with all posts that use that tag or category. On a post you can add as many categories and tags as you need to make the post easier to locate. Here’s an example of a post with the categories and tags displayed at the bottom of the post. 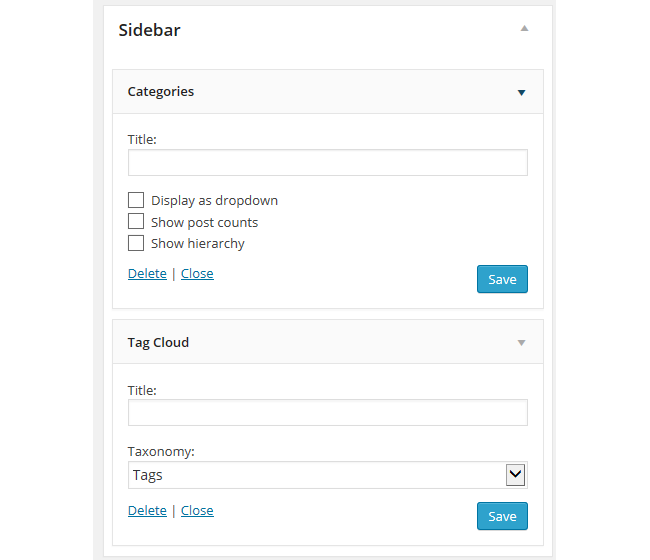 The categories and tags you use are displayed in your sidebar using the category widget and tag cloud widget (via Appearance > Widgets). The category widget is normally placed above the tag widget. Here’s an example of the category and tag cloud widget from a personal Educators blog. Categories can have unique names and be wordy; you want them sufficiently descriptive so your reader understands the type of subject matter they will find when they click on the link. As a general rule you tend to limit the total number of categories you use on a blog. 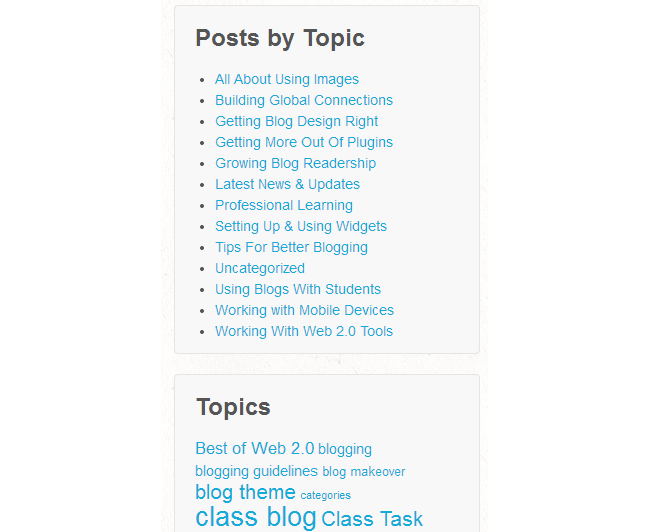 On class and students blogs categories may be used more like tags; and some use only categories or tags rather than both. 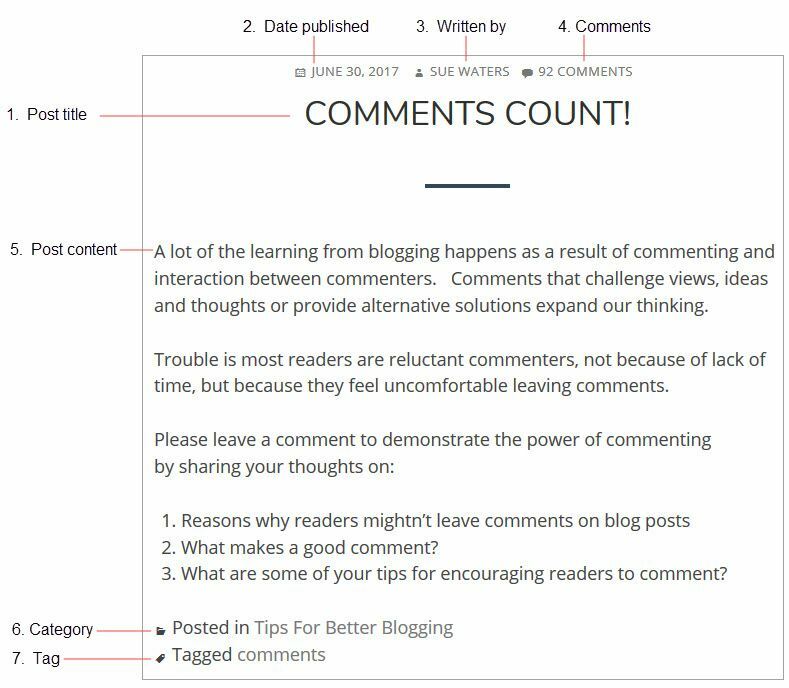 The key is to think about the structure you want to use to help your readers easily find posts. For example, you might use categories like Class News, Blogging activity, English, Science, Maths and then for tags you might use student first names (if the student writes the post), Algebra, fish anatomy. For information on how to add categories to posts please check out this support information. Tags are normally short, one or two words, and are generally keywords (i.e. terms readers would be likely to use if they searched your site); terms that your readers will understand. The larger the size of the word in the tag cloud the more posts that have been tagged using that term. For information on how to add tags to posts please check out this support information.